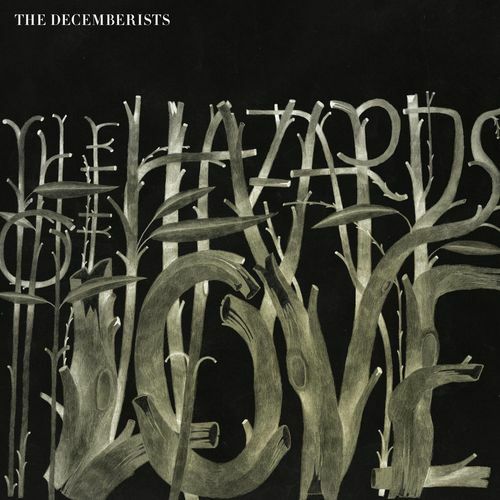 In 2008 Colin Meloy and his troupe of troubadours attempted to lay to rest a question which had been troubling indie rock fans for some years: ‘What exactly would the Decemberists have to do to score less than 8.0 on Pitchfork?’ The answer, released in 2009, was ‘The Hazards of Love’. It’s a proper concept album, a rock opera if you will, telling the tale of Margaret, who loses her heart to a shape-shifting forest spirit, the pair of them subsequently falling foul of his Mother, the abominable Queen. As you do. It’s executed with verve and glee and, crucially, without any sense of irony. Meloy and co. had long acknowledged a debt to Pentangle, Fairport Convention and the artists of the British folk revival of the late 60s and early 70s. On their earlier records ‘The Tain’ and ‘The Crane Wife’ they dabbled with both song cycles and ornate folk-rock compositions and ‘The Hazards of Love’ sees them work this through to its logical conclusion. I think it’s fair to say that the reception for the album was mixed. No-one really seemed to know what to make of it. The band had broken through with ‘The Crane Wife’ and i’m sure were expected to turn out a collection of stadium-sized tunes to cement their success and buy some bigger touring buses. Instead, this, an elaborate and full-blooded take on an outmoded form drawing in several singers to play a cast of ripe characters tottering their way through a pseudo-mediaeval narrative. The first time I listened to THOL I cleared the evening, opened the gatefold sleeve for the lyrics, and carefully followed along the themes and characters through the plot development. Turns out that’s the very worst way to go about it. The joy and the beauty of the record is not in the concept itself, rather in its execution. As soon as I gave up on it and began to treat it as a collection of songs, it opened itself up as a delightful puzzle and a whole lot of fun to get involved with. The recurrent riffs and motifs that run throughout the piece form seams which occasionally erupt to the surface, coming to sound like old friends when they return. The cast of vocalists work well together but none can hold a torch to Shara Worden of My Brightest Diamond, who gives a full-throated turn as The Queen. If this opera had scenery, she’d be chewing it Pacino style. My impression at the time was that most critics thought ‘The Hazards of Love’ was a mildly embarrassing mis-step, an indulgence from a band who had delved too deeply into their own affection for the music, the styles and the stories of the Olden Dayes. These days it just sounds like one of the Decemberists best albums, with memorable songs, great performances and a sense of a band coming together to create something in unison. Nick listened: When I mentioned in my office that we were having a “concept album” evening a DRC, Ian (a potential future member) immediately said “The Hazards of Love!” I bought a Decemberists album once (The Crane Wife, I think – they’re still packed away for moving still so I can’t check) but wasn’t entirely taken with it for whatever reason – sometimes it’s just not the right time to get into a record or a band, is it? So I was intrigued to hear THOL when Rob said he’d thought of it immediately too. I wasn’t disappointed; in fact I really enjoyed it, although, as usual on first listen to a record, I paid absolutely sod-all attention to the actual lyrics (Twilight-esque as they seem to be, with their tales of shapeshifting romance), but quite a lot of attention to the music, which was rich and rewarding, even when it dove headlong into prime Deep Purple Hammond-and-guitar-solo territory. Perhaps a little long (I’ve little tolerance for records that stretch much beyond 45 minutes these days), the only other criticism I’d throw at THOL is that I don’t really like Colin Meloy’s voice, which is too close to the pancreatic lost-my-dog-on-a-string moan of that guy from Neutral Milk Hotel. I’d love to hear THOL again, and maybe even pay attention to the words. Tom Listened: We’ve had Marillion. May as well quote Meatloaf….Nick took the words right out of my mouth (thankfully not while he was kissing me). I don’t have a problem with Colin Meloy’s, or Jeff Mangum’s, voice and I haven’t ever connected the two but other than that I echo everything he said – a little too long, a little too indulgent at times, but, in general, surprisingly enjoyable, accessible and catchy…and on an initial listen much better than The Crane Wife. I liked it! Graham Listened: Heartland lesson learnt, I just listened to this and picked up the lyric sheet on the odd occasion. Really grabbed me from the off with and immediately accessible (perhaps it had the Kayleigh factor in concept album terms?). Sad old hippy that I am, I really ‘dug’ the “John Lord’ish” keyboards and some of the guitar solo’s that I wasn’t really expecting to hear. Would take a good few listens for me to appreciate the full ‘concept’ as it were, but something I would be quite happy to do.